Use an angel food cake pan (or a bundt cake pan) to make it easier to shave the kernels off the cob with a sharp knife. I used to grow enough corn that we could eat it for dinner every night during August and still have enough to freeze for winter. Once you’ve been eating home-frozen corn for a few years, it’s difficult to be satisfied with store-bought. But these days, I depend on the farmer down the road to grow my corn. The Conants sell sweet corn from mid-August through early September and it’s the most flavorful corn I’ve ever eaten – my own included. Buying sweet corn at $5 or $6 a dozen is a good deal for dinner, but that would add up to $80 for a year’s supply of frozen corn – plus the six (or more) hours of labor to do the freezing. Instead, I get on a special list to be called when the Conants either over-pick or have too much corn ready at one time. At half price I don’t mind spending a long evening sweating over boiling water and turning my countertops and kitchen floor into a sticky mess. Ask around and maybe you can find a similar deal close to home. It takes seven or eight ears worth of sweet corn to fill a one-quart freezer bag. So to get 25 quarts of frozen corn (the minimum amount I try to freeze each summer) you need to start with about 200 ears of corn. If you haven’t frozen corn before, here’s a nice illustrated guide to the steps. It’s geared to freezing a large amount of corn at one time (500 ears) but fun to see how it was done in most farm kitchens 50 years ago. This second guide is geared to more modest quantities of corn. I usually do two freezing sessions of 100 ears each. That’s about as much as I can take at one time. I should say as much as we can take. It’s a job I couldn’t do solo. The shucking, de-silking, cooking, chilling, cutting and bagging all have to happen within a few hours. Believe me. You’ll want help. And some good music. Freeze corn the same day it was picked. If it’s older, you may as well just buy your frozen corn at the grocery store. Sharpen your knife before starting in on the job. If you haven’t cut kernels from a cob before, you’ll get the hang of it by the end of the second dozen. Stockpile lots of ice. The cobs need to be cooled in ice water for just as long as you cooked them. You’ll be glad to have stashed some big bags of ice when you run out of what’s in the ice maker after about 20 minutes. Buy good-quality freezer bags. Thicker is better. Flatten the bags after filling and stack them like pancakes. Label with the date. Is this the Conant’s Farm in Richmond? I grew up in Vermont and was friends with Sally when I was a young girl. Gotta say she had the best 7th Birthday Party ever!! Hi. Yup, it’s the same Conant family farm right there on the Winooski River. Happy sweet corn season wherever you are now! great way to get a ‘deal’ on your corn. We are eating our corn on the cob fresh, I don’t plant enough to freeze some. Have to admit a few years ago I got this thing called a “Corn Zipper” and I’d never do corn with a knife again. It was somewhere between $12 and $15 and it not only gets the kernels off the cob perfectly, you don’t have that knife blade all slippery waiting to slice something open. I can do 50 ears in just a few minutes! My son was going to buy me a “corn zipper” but said he was doubtful it would really work. Will have to give it a try! and tried it out over the weekend in my bundt pan. 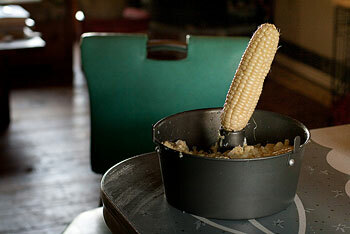 The cob is much easier to hang onto and the cut corn really does fall right into the pan. I use an electric knife and the bundt pan and can do a lot of corn in a short amount of time. Just make sure it’s non-GMO corn. Good luck finding that. Otherwise, it’s junk food. There is very little if any GMO SWEET corn being sold….so don’t be scared. Also, if possible ask the farmer who grew the corn whether it’s a non-GMO variety.